On December 19, 2017, China announced the official start of its national emissions trading system (ETS) construction program. When fully implemented, this program could more than double the volume of worldwide carbon dioxide emissions covered by either tax or tradable permit policy. Many of program’s design features reflect those of China’s pilot programs but widely differ from those of emissions trading programs in the United States and Europe. For that reason, the workings of Chinese national carbon market are both intriguing and unfamiliar to those experienced with western markets. 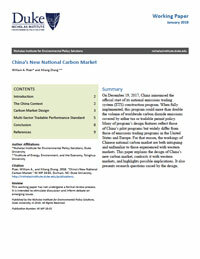 This paper explains the design of China’s new carbon market, contrasts it with western markets, and highlights possible implications. It also presents research questions raised by the design. Findings from the paper are reflected in an article in AEA Papers and Proceedings.